Being an eager student of languages, I sought to dazzle recent visitors by personally translating an upscale Dutch menu before their very eyes. My visitors were very gracious and would probably have attempted to order based on this spare and vastly imperfect translation. Luckily, the restaurant’s key man took pity on them and beautifully described each menu item in detailed English. Unluckily, I insisted on translating the extensive menu at a local pancake restaurant to them the next day: “pancake with cheese and some other stuff, pancake with salmon and a few other things, pancake with something green …” and so on through thirty or so menu items. Sounds like me in Estonia 🙂 Loads of fun! I think you did very well considering you haven’t been there that long! I think it might be very hard to study Dutch with much persistence in Amsterdam as it’s such an international place! In Utrecht a little bit of Dutch helps smooth over social gaps. That said, it’s still not necessary at all. So I suppose I’m studying it as a hobby of sorts. Easier on my neighbor’s ears than me taking up the viola. This made my day. I’ll try “part of a cow”, I guess. I should get paid to translate menus, right? Ordering with limited language skills is relatively safe here as you’ll always end up with some combination of potatoes, meat/fish/vegetarian main and a vegetable. There seem to be few surprises. You’re doing great with the language, Jen. The only thing I recognized was “chocolate” under dessert and frankly, that’s all that matters. And KFC. Pity it’s not a slightly more globally useful language (but don’t tell them I said that)! Oh, I also noticed just today that there is a KFC in Utrecht. You’ve cravings are save here. I have tears coming down my face from laughing! Please translate all menus from now on! 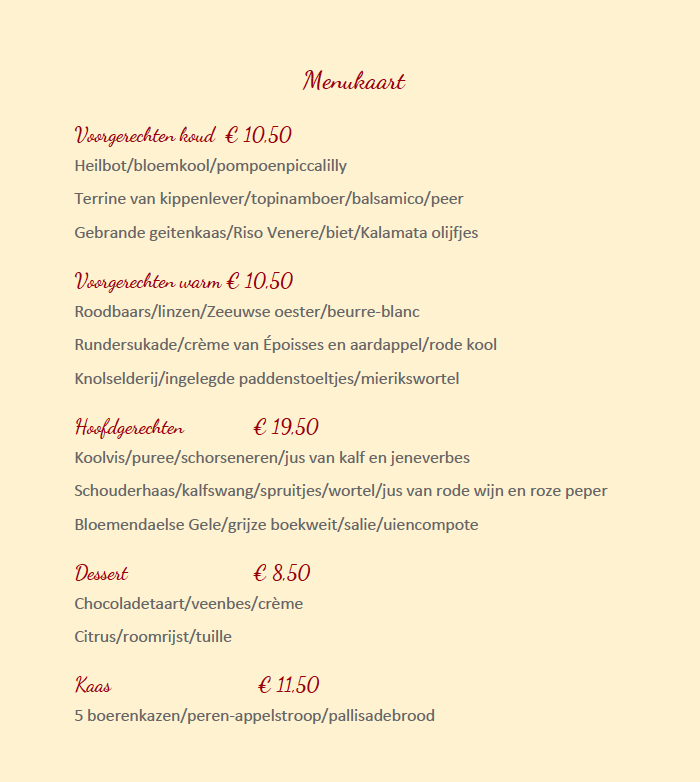 Send any and all Dutch menu translation jobs my way. Ha. The pancake menu did it for me. Sometimes you’ve got to roll with what you know, you know? I didn’t mention the part where I accidentally cancelled their airport taxi while trying to wing it with my Dutch, did I?